December is the darkest time of year in Scandinavia. Located at the "top of Europe" in the northern hemisphere, the countries of Denmark, Finland, Norway and Sweden experience the darkest time of the year during the Christmas season when the nights are longest and the greater part of winter is still ahead. “Jul” or Yule, was celebrated long before Christianity came to Scandinavia. At that time it was an observation of the winter solistice, that from then on the days would become longer and darkness gradually recede. It was a celebration of light returning. The word “jul” or Yule means “the change” of “the feast of feasts”, with reference to midwinter reveries celebrated around new years. There was plenty of mead and plenty of food, indulging in a sort of magic of plenty. It was believed that it would ensure prosperity and plenty for the coming year. 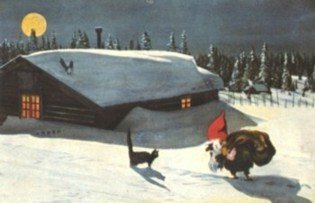 The “yule night” was loaded with supernatural powers when even the animals could speak. The snow lies deep in the countryside and a moonlit night may look very much like the scene in the old Christmas card shown below. Of course the card also depicts "julenissen" or "jultomten", a Scandinavian version of Santa Claus. Notice: He has no reindeer or sleigh. he is carrying the gifts on his back. No wonder then that there is the need to find refuge from the darkness - and the only proper refuge seems to have been the home where comfort is assured. Plants are on the windowsill and cut flowers in profusion on tables do much to dispel the gloom. All this would be to little avail if Christmas were not approaching toward the end of the month. Christmas in Scandinavia is an antidote to darkness, a way to break winter's hold. Nowhere else in the world is it celebrated quite so warmly - or with so much candlelight and food - as in this northern corner of Europe. In North America you will be swamped with images of Santa and sugar plums. Songs by Bing Crosby will ring nostalgically through our minds. Streets, shopping malls and schools will be festooned with tinsel, holiday decorations and ornamentation designed to get one and all into the season of gifts and giving. Increasingly the Internet has taken to the holiday spirit, now competing with the mall is the monitor. And on the monitor nothing is local, the world is at your fingertips, including Scandinavian Christmas. -- "of calling back the children of a family who have launched forth in life, and wandered widely asunder, once more to assemble about the paternal hearth, that rallying-place of the affections, there to grow young and loving again among the endearing mementoes of the old fashioned Christmas of childhood." 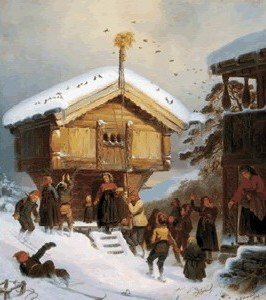 - an excellent example of early scandinavian christmas traditions. The high point of the Scandinavian season is not Christmas Day, but Christmas Eve. This part of Scandinavian Christmas Traditions too may have to do with darkness. 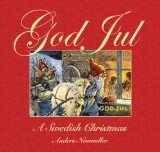 Coming to dinner through streets wrapped in darkness, having the door of welcome opened and yellow light suddenly streaming out into the dark - this belongs to Christmas in Scandinavia and is in keeping with Scandinavian Christmas Traditions. Take a look at the painting Julegilde (Christmas Feast) by Lars Jorde. The original painting hangs in Norway's National Gallery in Oslo. It shows a house lit up from within, with glowing lights in every window, people taking their leave (or are they just arriving?) at the door, sleds parked outside in the snow. The atmosphere is unmistakable. As true a depiction of Scandinavian Christmas Traditions as you are likely to see. Blest is the sound of the Christmas Bells! A tradition in million of homes across America, this bestselling Christmas collection features dozens of timeless classics -- memorable songs by favorite artists that will make the holidays so special. Over two hours of spectacular music.